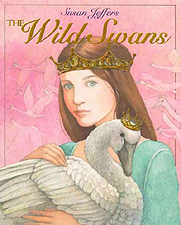 When her eleven brothers are turned into mute swans by their evil stepmother, brave Eliza endures great suffering to break the spell and rescue them. A story of loyalty, deceit, and the healing power of love, this classic fairy tale is exquisitely illustrated by Susan Jeffers. Hardcover Picture Book. 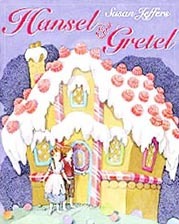 One of the most beloved fairy tales of all time, the story of two lost children who stumble upon a candy house belonging to a witch. is magically retold by New York Times bestselling illustrator Susan Jeffers. Hardcover Picture Book. 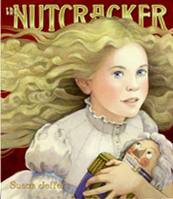 New York Times bestselling artist Susan Jeffers has created a Nutcracker unlike any that has gone before, with a lovely spare text based on the ballet. This is the perfect gift to share with children before they see The Nutcracker. Everyone who has seen the ballet will cherish it -- as will anyone who enjoys stories where love triumphs. Dustcover has glitter in girl's hair. Hardcover. Ages 3 - 8. 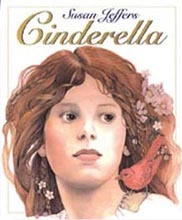 Cinderella's transformation from poor girl to princess never fails to captivate young ones, and this stellar retelling, exquisitely illustrated by Susan Jeffers, is a must for every library. For this hardcover reissue, Susan Jeffers retouched her pen-and- ink and dye illustrations, making them even richer. Her brilliant artwork is showcased in a new interior design featuring a fifth-color gold border. Hardcover Picture Book. All ages. 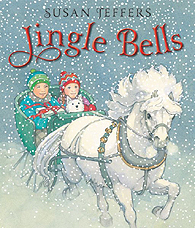 Ride along with a girl, a boy, their pony, and a mischievous dog as they travel to Grandma’s house. With playful animals in their path, their journey gets a bit sidetracked. But soon enough they arrive at Grandma’s—where an unexpected visitor fills them with holiday cheer! Oh no! Emma is in trouble! In this new version of the classic song, Santa comes to the rescue. 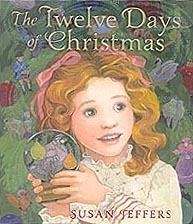 Susan Jeffers's artwork sparkles with the excitement of a magical journey, revels in the fun of the twelve preposterous gifts, and brings us home in time for a joyful Christmas morning. Full of treasures to find among the trees, this book is perfect for introducing children to great American literature. Its elegance and magic will be cherished by the whole family. Award-winnig illustrator Susan Jeffers brings the wintry woods to life with richly detailed , subtly colored art-work. Robert Frost is a poet who could and did speak to everyone, but rarely more memorably than in this evocation of the quiet delights of winter. Hardcover Picture Book. All Ages.